Hansika Motwani and Kajal Aggarwal are two actresses who constantly keep raising the fashion standards in South Indian cinema. Superstars of the South, Hansika Motwani and Kajal Aggarwal are often appreciated for their drop dead gorgeous looks and have a loyal fan base that tracks their every move. This time, the two divas have outdone themselves and have touched new heights, as far as their style game goes. 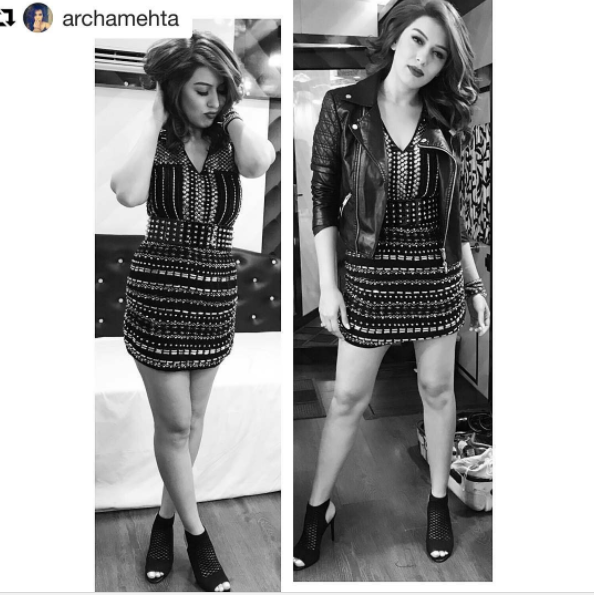 Styled by ace stylist and costume designer, Archa Mehta, the two ladies recently attended two separate events, but one thing was in common – they both looked like a dream! Kajal was recently spotted on the sets of the film Vijay 61, and rocked a black off-the-shoulder dress. Her ensemble was set off with perfect wavy curls and a diamond necklace. Her accessories were kept to the minimal to maintain a classy yet chic look and her make up too, was just the right amount of glam. Strappy sandals rounded off the outfit and the shutterbugs snapped away, as Kajal flashed her 1000 watt smile! Hansika Motwani, another hottie on the block, was photographed on the sets of Gulebakavali. In a never-seen-before avatar, the young star posed like a true badass and pulled it off like a complete pro. Dressed in an embellished studded dress, with a leather jacket and netted heels, Hansika looked hotter than ever. Her hair was blow dried to perfection and she had the make up to match. Overall, both the stars nailed their respective looks and though the credit goes to their awesome stylist, the girls too, need to be applauded for having the right attitude to carry it off!